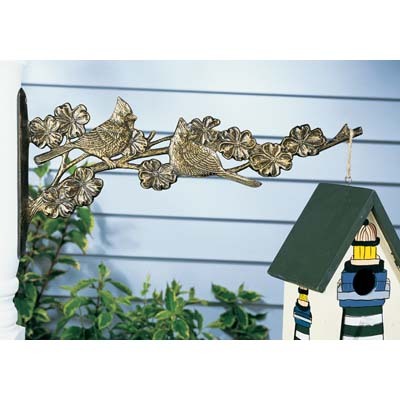 The Cardinal Nature Hook is perfect for hanging flower baskets, wind chimes, bird baths, and feeders. This hook is made from rust-free, recycled aluminum and protected in a weather-resistant French Bronze finish. This hook will hold approximately 7-10 pounds. Maintenance free with hardware included for installation. This decorative yet functional hook can be used in the garden for hanging baskets or pair it with a matching bird feeder, twilight, or tea lantern. Manufactured in the USA from 100% recycled aluminum and hand painted in a durable weather resistant finish, this hook will last a lifetime. Product usually ships in 3 days.